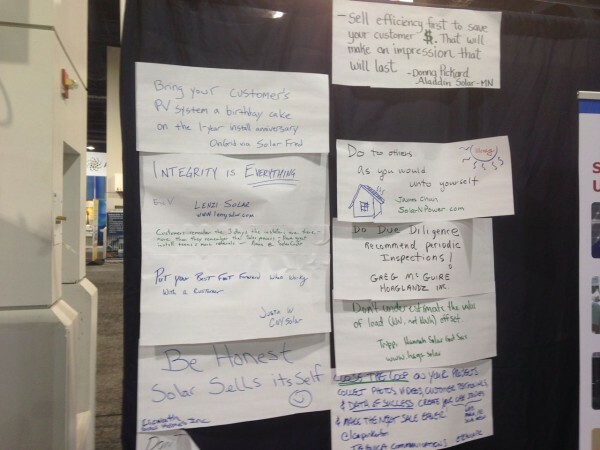 In part 2 of my annual solar event marketing hits and misses, we’ll explore some more specific hits and misses that I found on the Las Vegas SPI show floor. First of all, although final numbers haven’t been released, SPI 2014 seemed to be very well attended. The floor looked crowded and exhibitors that I talked to said that booth traffic was much improved over Chicago’s show, especially on the first half of the first floor showroom. More exhibitors came back to Vegas, as well. In fact, many attendees I talked to were surprised to realize that there was a huge back end of the first floor with even more booths, not to mention an entire second floor. 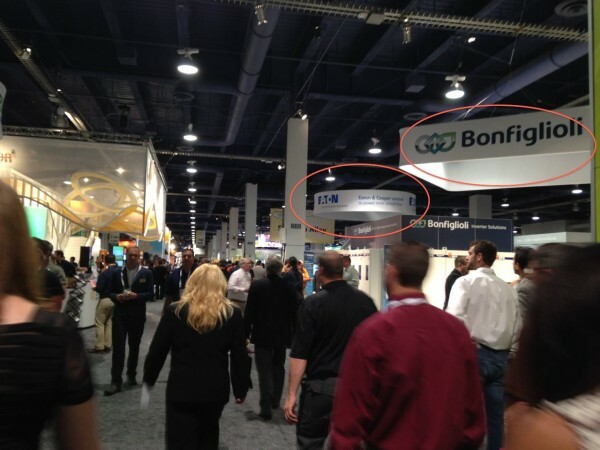 There were so many exhibitors this year, it was difficult to spot the booth you were looking for. So, a ceiling banner not only helps people to know your brand, but also to find it among the myriad of exhibitors in a large hall. Another healthy sign that SPI was back in form was booth size. Last year in Chicago, booth size (and the number of exhibitors) had shrunk with the dark years of consolidation. Sun Edison and many other big solar brands reserved larger footprints this year, and they filled that space from top to bottom. 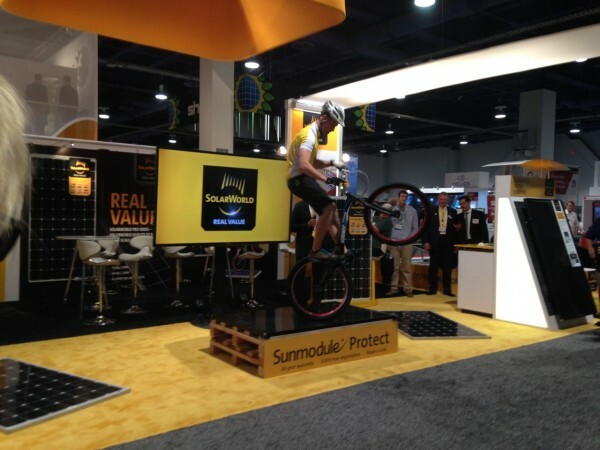 In the “Stand out and educate” event marketing department, SolarWorld demonstrated the strength of its solar panels by having a trick mountain bike rider hop up and down on a panel. It was fun, educational, and the stunt did draw a crowd. SMA really went all out with its Las Vegas theme this year and created a clever “Boxing Ring” where “fighters” compared its various inverter products, and on-camera sports announcers also made relevant commentary. While the booth certainly drew traffic, it seemed intermittent. I wonder if the lack of seating made people only pause from their SPI floor travels. Seating might have made them stay a while longer. On the clothing side, I like the matching tie trend and branded lanyard for booth salesman, such as this Q-Cells blue tie. I saw other brands do this, as well. 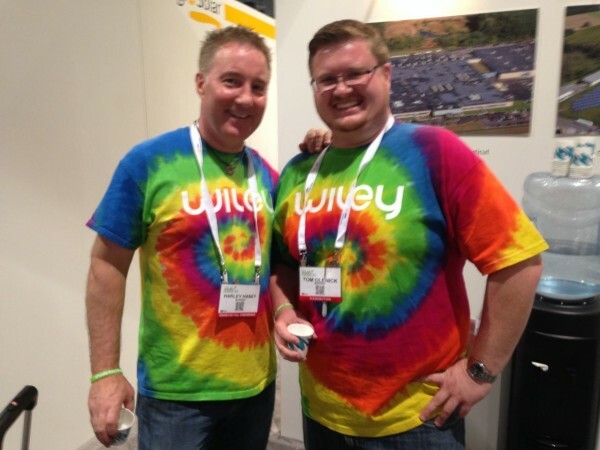 Wiley took this matching clothing trend to a whole different level with their matching tie-dye psychedelic shirts. Rad, dudes! 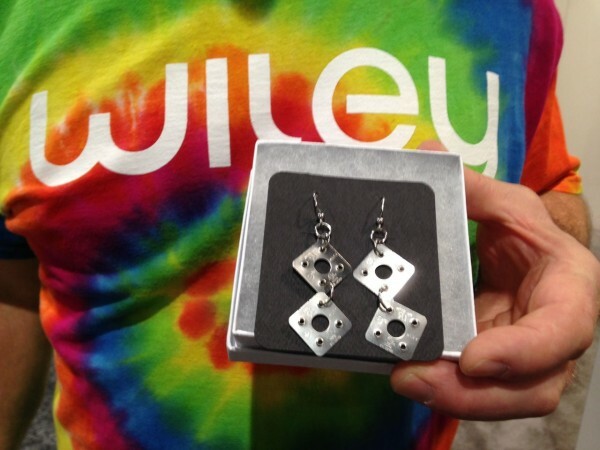 They also gave out some jewelry to select customers that integrated their products. I have to say that I do like it when you can creatively integrate your product into your booth design. 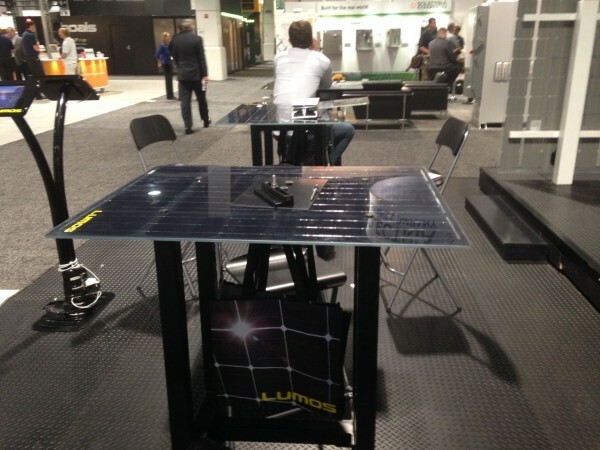 Take these cool Lumos solar tables. It’s such a great opportunity to sit down with visitors and have a conversation about the panels and point to their BIPV-like features. Notice also the brand imprint on the edge. Another trend I saw was the interactive kiosk/game. 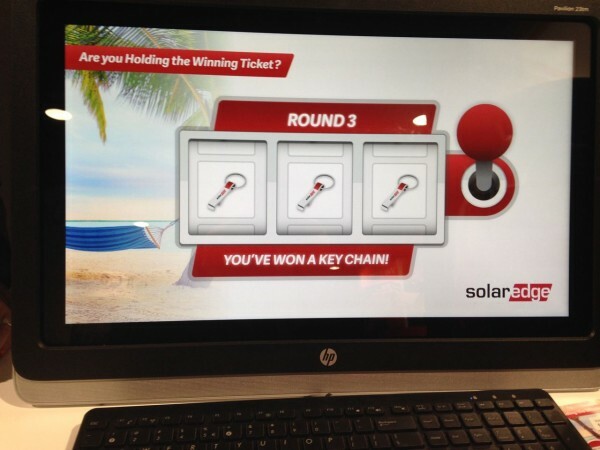 SolarEdge not only had an expert speaker series, they also created a fun slot machine game where you could enter your info and win some SolarEdge swag—and a chance to win a trip to Hawaii. 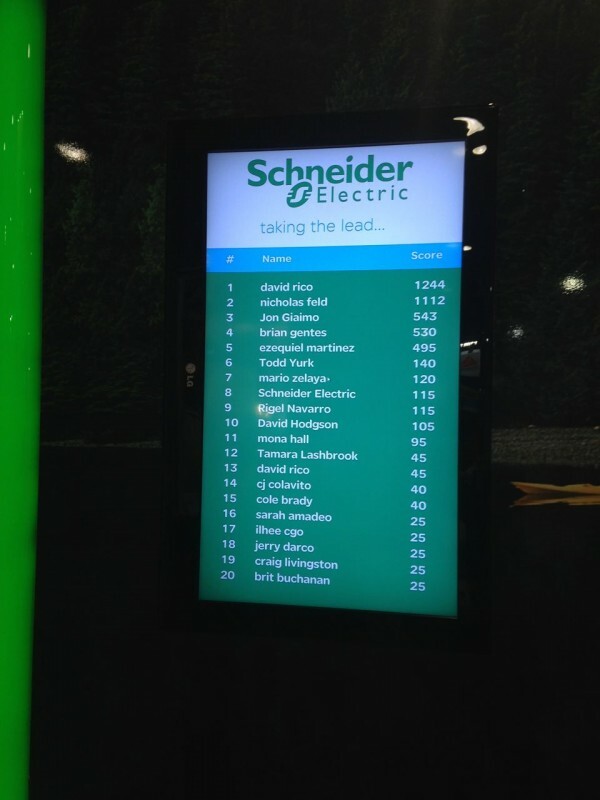 Schneider Electric also created a kiosk quiz game that tested your solar electrical knowledge on off-grid designs, backup storage, and telecom towers. Correct answers racked up points, and a leader board showed top winners who won either an iPad, headphones, a GoPro camera. Below is an image of the leader board section. The only miss with this was that the game kiosk had to be moved to the side of the booth due to an unforeseen exhibit floor column. As a result, fewer people probably saw the kiosk and played the game. 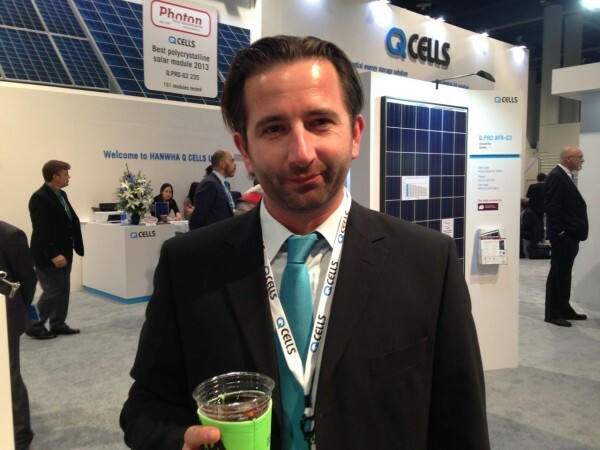 Finally, take a look at Ongrid Solar’s low-tech but interactive booth game. 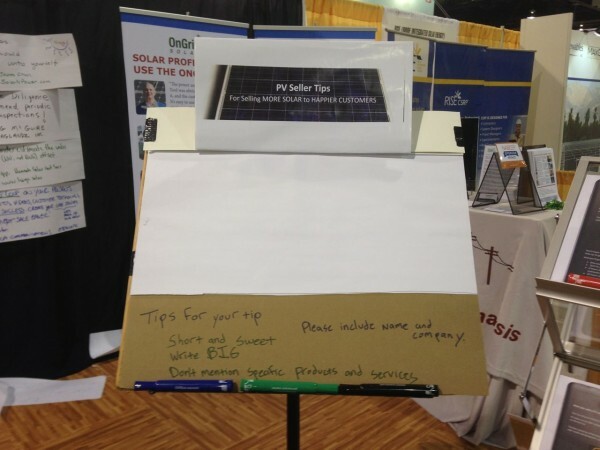 Installers were invited to write down their PV Selling Tips. It not only draws in Ongrid’s target market of residential solar installers to contribute their expert thoughts, but since Ongrid offers a proposal software tool, participating also served to open up the relevant conversation about that product, as well. Overall, I saw a lot more hits than misses at this year’s SPI. 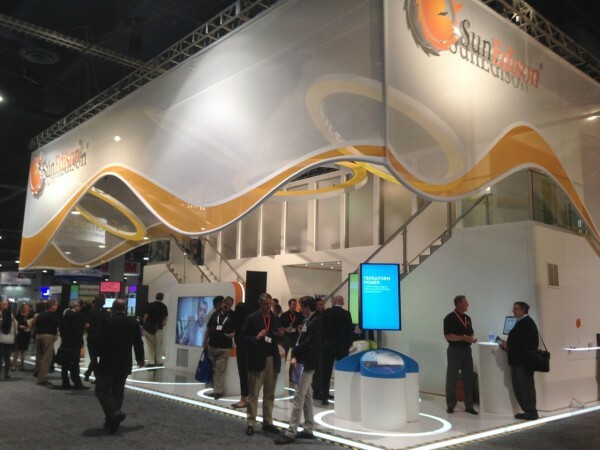 Event marketers are clearly getting more creative, more educational, and … UnThinking Solar. As usual, you are spot on, Tor! I agree that the expanded floor was encouraging, but made it difficult to get to all booths. Also, I found that I hardly spent any time on the second level, as most of the action was the middle aisle on the first floor.